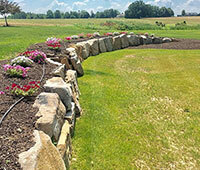 Need a new retaining wall but tired of the boring look of stacked retaining wall block? Do you want to stand out from all your neighbors with a unique, natural option that will outlast and outperform their manufactured products? Think this will cost an arm and a leg?! Contact us and let us show you how we can give you a one of a kind finished product that is competitive with the cost of other options. Feel free to browse our portfolio or checkout our Facebook and Instagram page for more photos. Boulders of all sorts of shapes and sizes can be a great creative and aesthetically pleasing way to create more flat and usable space at your home. The possibilities are endless with natural stone because no two stones will be the same. 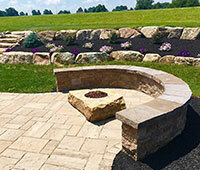 The use of natural stone can create a landscape that will stand out for years to come. Our crew of installers can create walls to meet your needs in the residential and commercial applications. In different municipalities walls are required to be engineered once they reach a certain height. We are able to work closely with the engineers to build your wall no matter what the height requirement is. 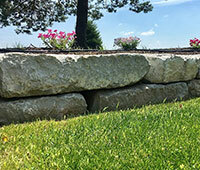 Is your property over grown and hard to maintain because of boulders and other rocks everywhere? Is your old boulder wall falling apart and in disarray? Don’t let this intimidate you! Our team of installers can use that stone to create a new and refreshed boulder wall with that stone. If you look closely at our pictures in the portfolio you can see that each piece is carefully selected to match the previous stone. This helps to keep everything tight together and keeps weeds and other organic materials from growing in the wall. It also is much more aesthetically pleasing than the common boulder “walls” where contractors with no experience simply pile rocks on top of each other with no thought given to structural stability, drainage, ease of maintenance or looks. Want to see what they can look like, but pictures are not letting you get the full effect? Schedule an appointment to come and take a look around our shop. We have many different sample steps and walls for you to look at and gain some inspiration. With over 200 lineal feet of walls, there is sure to be something that will catch your eye! We also have a variety of sample paver walkways to allow you to see how boulders and pavers can complement each other perfectly.